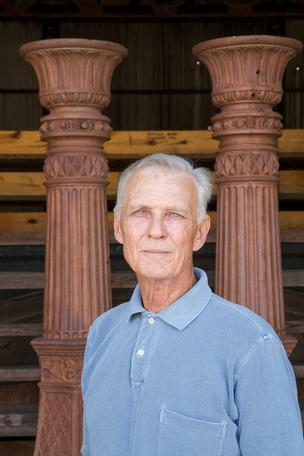 After seeing combat in Vietnam and leaving the military, Larry Giles went on to develop a passion for preservation, amassing the largest collection of building artifacts in the country over the past 40 years. Having been a Marine “really helps with organizational skills and the ability to tackle large projects and stay with them,” said Giles, 66, who in 2007 created the National Building Arts Center, located on a 15-acre site in Sauget, Illinois.There, 13 buildings of the former Sterling Steel Casting Co. foundry house crate after crate of history in the form of sculptures, columns, friezes, ornamental brick, ironwork and terra cotta. Giles has long hoped to display the collection, establish a research library and have a degree program in conservation through a local university, but funding has been an obstacle. Items range from an assortment of more than 2,000 door knobs representing various architectural periods to a complete facade from St. Louis’ Gaslight Square. There’s also a collection of more than 100 complete cast iron storefronts, an ecclesiastical collection with artifacts from local Catholic churches and a glass collection featuring the vaulted glass atrium dome from the 1902 National Bank of Commerce in St. Louis. Giles estimates he has approximately 300,000 items on the site, which at first glance looks like a ghost town after having been the workplace of almost 300 foundry workers. While most of the collection is from St. Louis buildings, other cities represented include Chicago, Philadelphia, Los Angeles and New York. There are also thousands of items intended for the research library, such as books, photographs, drawings, prints and other materials, including the world’s largest collection of architectural postcards, which date mostly to the late 1800s. A longtime history lover, Giles owned St. Louis Architectural Art Co., an architectural recovery, materials conservation and building restoration firm, for nearly 30 years before establishing in 2002 the St. Louis Building Arts Foundation, which controls the center. The center’s holdings are so comprehensive that the Brooklyn Museum in New York chose to transfer most of its collection of architectural artifacts there over the past several years. It features several thousand pieces, including terra cotta, carved stone, cast iron, cast cement, woodwork and signage, Giles said. What attracted you to architectural history and conservation? I’ve been fascinated by the city’s history and architecture since childhood. My grandmother’s boyfriend, whom I referred to as grandpa as a kid, was a real St. Louis history buff. There were very few details about the city that he wasn’t privy to. He got me interested in history and the history of St. Louis. We used to ride around the city and he’d tell stories and point out places and buildings. Why did you start the St. Louis Architectural Art Co.? It evolved out of a rehab company I started in 1972 called Soulard Resources. I started it with a couple of architecture students from Wash U. At that time there were close to 300 empty buildings in Soulard, and we wanted to stabilize the buildings that were vacant and vandalized, find people to take them over and build a community again. Soulard at that time looked like Dresden after the bombing. We had a romantic vision about what the neighborhood could be. We even went on radio trying to promote the area. After a year or two we realized we didn’t have the financial horsepower to get the company off the ground. When we closed Soulard Resources I continued the salvaging of historic materials and started the St. Louis Architectural Art Co.
Where did you get the idea for a museum for building artifacts? The idea for an architectural study collection goes back to the late 1930s. It was first proposed for the Jefferson National Expansion Memorial by Charles Peterson of the National Park Service, who is largely considered the father of preservation in the United States. He had support from the St. Louis preservation community at the time to salvage significant parts of the buildings that were being demolished for the arch grounds. They saved and put in warehouses artifacts similar to what we’ve got here to become part of the Museum of American Architecture. That project was abandoned in the early 1950s by the Park Service and the collections were disbursed. What are the most significant pieces in your collection? Probably the cornice from the Title Guaranty building, originally the Lincoln Trust building, on the southwest corner of Seventh and Chestnut. It’s one of the finest terra cotta cornices anywhere in the world. It’s a series of sculptured winged victory figures that surrounded the building at the top. It was designed by St. Louis’ most prestigious architectural firm, Eames and Young. It was built right across the street from the Wainwright Building. What’s in your ecclesiastical collection? Altars, baptismal fonts, communion railings and statues. Most of the items are from former Catholic churches that were sold off by the Archdiocese when parishes were consolidated on the north side of St. Louis. We worked with the Archdiocese and agreed to dismantle and preserve a lot of the marble work from a half dozen really significant churches that were going to be sold off. There are probably about 100 crates of materials, and the crates are about 30 cubic feet each. Where can people view some of the artifacts? At the Missouri Botanical Garden’s Temperate House behind the Climatron there’s a carved stone entrance from a former Catholic school. It’s permanently installed. The Sheldon Art Galleries have an installation. The Missouri History Museum has an exhibit called “Seeking St. Louis” with some artifacts from St. Louis buildings. There’s a cast iron storefront and examples of roofing tiles. There’s an entrance from one of the first schools built in St. Louis. We also have a great exhibit atWells Fargo, built for A.G. Edwards. Where to you get most of your funding? Right now from the sale of duplicate or unwanted or nonessential material in the collection. There’s a lot of duplication in the collection, like some of the sculptures and medallions. We’re putting a catalog together to offer some of this material for sale. What do you enjoy most about what you do? I enjoy the physical, hands-on aspect of salvage work. I love operating cranes, fork lifts, boom trucks, air compressors, air chisels and pneumatic hammers, and using scaffolding and rigging. I’m also learning new things all the time, which is stimulating. What was your first job? I worked as a carpenter during summer vacations when I was 12 and 13. I worked with a company that was building new homes out in South County. I also sold newspapers. I sold the Post and the Globe from a paper stand at Big Bend and Manchester when I was probably about 12.